I think everybody has seen 'Show options' button over the HTML Editor / under the Page Title and Main Page options. When you click 'Show options' button, you will see two options. If you had activated 'Hidden Pages' extra, you will see three options. First option is related with the title view in the menu/navigation. Second option is related with the page link. Normal Page means that the address is what the title is. If the title is 'home' , the address is www.canerfc.page.tl/home.htm. Menuentry without a link means title appears in the navigation but nobody click it! 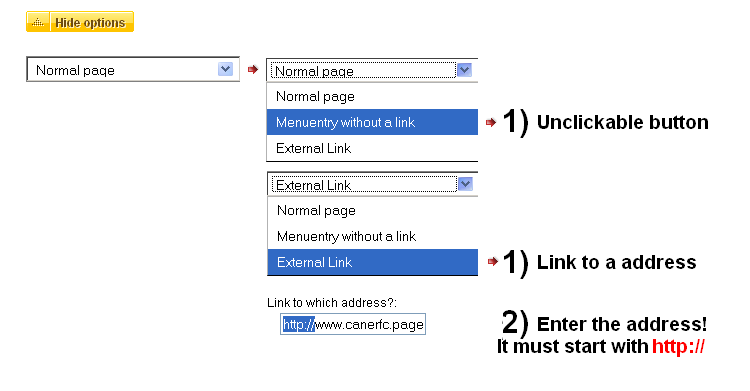 External link means that you can give a different link to the button in the navigation. As you see, I explained the detail in the picture about 'External link' . 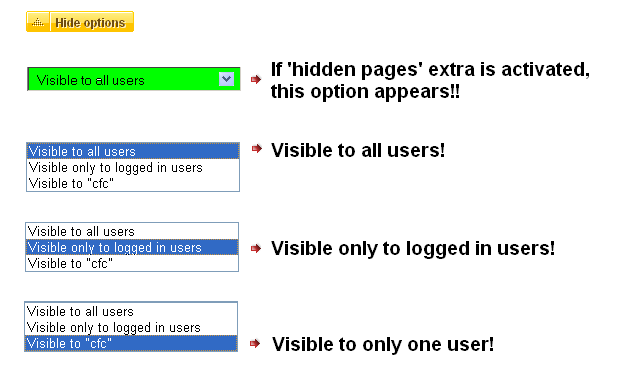 Third option is related with page visibility! Sure, everybody can see your page. But, if you activated 'Hidden Pages' extra, you may want your users see the page.